First we received a couple of awards we were quite excited about. Тhen we enjoyed an awesome team-building retreat in the mountain. Right about the same time, we moved to a bigger office space to accommodate the growing pCloud team. After that, we got some great news from the Google Play Store: the pCloud app for Android has been downloaded more than 500,000 times – so half a million Android users are relying in pCloud for their photos, videos and files. Woohoo! 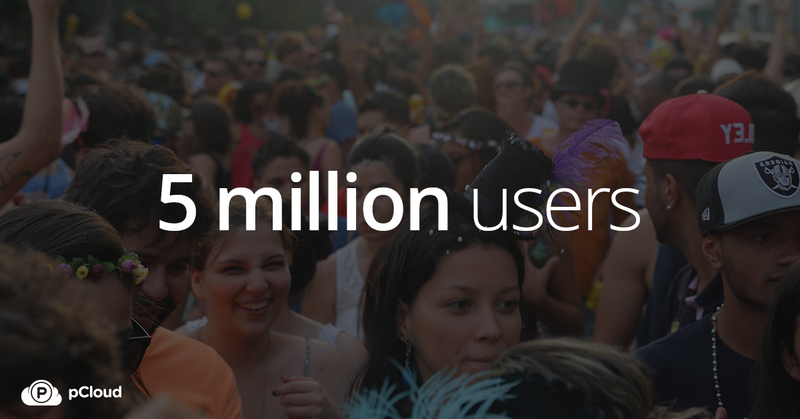 And last but not least, we reached a new milestone for the service: 5 million users. Five million! That’s roughly the population of Denmark! It was a mere 8 months ago, in November 2015, when we celebrated 3 million subscribers. Then in March 2016 we hit 4 million, and now we’ve added another million to the pCloud family. At this rate, we’ll have covered the entire population of the Earth in about 5 years (or something like that – we’re still too excited to crunch numbers and do proper math). Why is this growth so important and exciting for us? Because it took us under 3 years to get from 0 to 5,000,000 and that’s impressive. Because we work really hard to offer you a service so intuitive and reliable that it actually makes a difference for the quality of your life. Whether you use pCloud Drive, our web-based service, our mobile apps, and/or pCloud Crypto – they are all designed to let you handle your rich digital collections easier and more efficiently, have them with you everywhere you go, and make sure you never lose a file. Because of you – the 5 million people who chose to trust us with their files and use pCloud to store and share photos, videos, documents, and much more. You are amazing! So cheers to you, our 5 million users! Chin-chin!